‘Activist’ is no more a cohesive term than ‘voter’ or ‘customer’ – it is an activity which many people do, and many more should do. To read my thoughts on attitudes to activism and some basic advice: click here. I was quite lucky in that I was raised with both the Woodcraft Folk (‘hippy scouts’ is my best definition) and the Quakers – a pacifist religious group with no leaders, who believe strongly in equality and have a proud history of dissent – from the 1640s to the present day. We won the Nobel Peace Prize in 1947. No, seriously, all of us. Between these two groups I grew up with a strong understanding of the history of peaceful, successful dissent, and had plenty of examples of ways and times that ordinary people spoke up against injustices. We had speakers who’d done time with Nelson Mandela at Woodcraft, in Quaker summer schools we had people coming in from the Newbury Bypass to tell us what it’s like living up a tree to prevent ancient woodland being cut down, or a Catholic priest who – as an act of conscience – had smashed up a nuclear warhead transportation van. In Sunday School I was taught how to go floppy when making a human roadblock because that way you’re harder to move. I couldn’t believe that being a suspected protestor was enough to apparently warrant being arrested. Surely the right to express an opinion, however bizarrely, is one of the lowest-hanging fruit in a civil society? Since then: I’ve gotten active. Myself and fourteen others took the Metropolitan Police to court in four separate Judicial Reviews which were heard together at the High Court in June 2012. 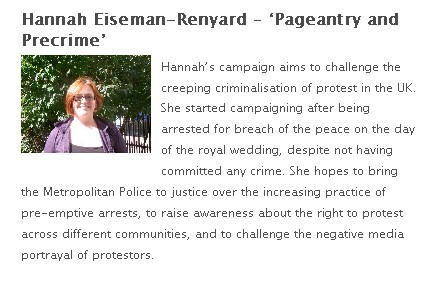 I set up the website Pageantry & Precrime to gather all the statements and videos into one place, and I reported from the High Court every day of the trial. In the time between the event and the trial I spoke to journalists, gave interviews, wrote press releases, and generally kept the issue in the media as much as possible for over a year. The case was reported all over the shop; from the Guardian the the Mail, the BBC to the Evening Standard. Though we lost the case, we definitely raised awareness, and we are looking into appeals. 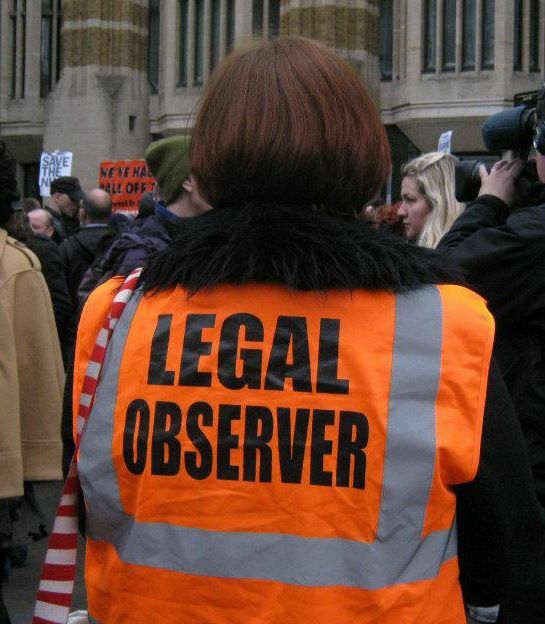 I also trained to be a Legal Observer – essentially volunteers who go to demonstrations to be witnesses for the protestors. We wear hi-vis bibs, make detailed notes on the policing, and hand out bust cards to protestors advising them of their rights. Often just knowing we’re there will keep the police on slightly better behaviour than they might be otherwise. And if the police are violent, use disproportionate force or start arresting people: we are there to take detailed witness accounts and advise people. Netpol’s new website: (almost) all my own work. I got in touch with Netpol – the network for police monitoring – offering my services as a web editor. I’ve been doing communications and web editing for them for over a year – including re-building their website. The work is fun, the people are lovely, and it’s great to know you’re making a difference. I was equal parts delighted and embarrassed to find out I’d been nominated for an award – the lovely Tim Gee – author of Counterpower – nominated me for the Sheila McKechnie Foundation Campaigner Awards. I was one of two finalists for the London Social Justice category and wound up eating some very nice canapes and met Jon Snow. But canapes and a nice little swatch to have on your website are not, and never were, what it’s about. And there’s plenty more I can and should be doing. Right now. I’m not sure what to say here, beyond: you can do it. You personally can make a difference to things which you care about. Personally – my background is a mix of writing and web-editing, so doing the media/communications side of things has been a no-brainer for me, but each & every person has skills they can put to use for causes they care about. You just need to stop waiting for someone else to make the difference – be the change you want to see in the world. Netpol – the network for police monitoring. Green & Black Cross (GBC) – an independent grassroots project set up to support autonomous social struggles within the UK. 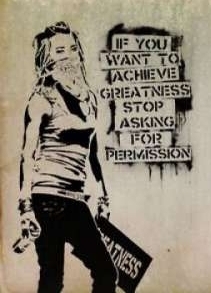 Posted in Activism, BlogBookmark the permalink.